This is a console game that I first wrote in VB 2013 and then re-wrote in C# 2013 as a learning exercise. Anyone who has ever played cards before has probably played BlackJack. The player is dealt an initial two-card hand and adds together the value of their cards. Face cards (kings, queens, and jacks) are counted as ten points. A player and the dealer can count his or her own ace as 1 point or 11 points. All other cards are counted as the numeric value shown on the card. After receiving their initial two cards, players have the option of getting a "hit" (twisting), which is taking an additional card, or sticking. In a given round, the player or the dealer wins by having a score of 21 or by having the highest score that is less than 21. Scoring higher than 21 (called "busting" or "going bust") results in a loss. A player may win by having any final score equal to or less than 21 if the dealer busts. First some Variables and a Structure, at Module level, to hold the deck of cards, the values of the cards, and the game statistics. There's also a Module level Random Object, which is used when shuffling the deck. In Sub Main, the suits Arrays are loaded, and also the values List. then the game loop begins. The playAHand Function prompts the player, asking whether to continue. The playGame subroutine is the core of the game. This sub handles Twisting, recursively calling itself as well as branching out to the showCards and updateStats methods. 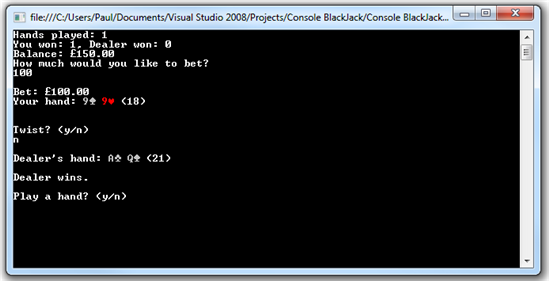 The winner Function compares the scores and writes output to the Console. The shuffle method, randomly shuffles the deck. The updateStats method updates the balance and statistics Variables in preparation for the next hand. The showCards method writes the contents of a hand to the Console, using appropriate symbols and coloring. Finally the val Function which is used when identifying card values.